Format: Jigsaw Puzzle; UPC: 681410190231; MPN: P16204; Brand: Re-marks; Pieces: 500 count; Size: 16" x 20"; Recommended Age: 12+. Condition: Like New. Purchased new and assembled twice. ALL pieces are accounted for, and everything is still in excellent shape. Includes mini poster. Same box design as that shown here. 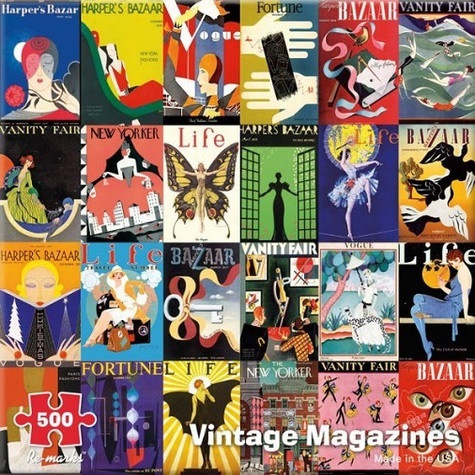 Explore the nostalgia and history of vintage magazine covers when you put together this highly detailed and colorful puzzle. The fonts and graphic design of each cover make this collage fascinating to assemble. Once completed, it measures 16" x 20". Made in the USA from recyclable materials. The shipping rate given here is for shipping via USPS Retail Ground within the U.S. only. Orders consisting of multiple purchases packaged together ship by any of these delivery methods at a discounted rate, usually for only $1.00 per additional item plus the shipping fee for the first item (determined to be the one with the highest delivery charge).